Career planning is challenging because there are so many factors to consider – core competencies, skills, passions, relationships, and simply making a living; in addition, the workplace is always changing due to adoption of new technologies and globalization (which is why there are some naysayers to career planning). 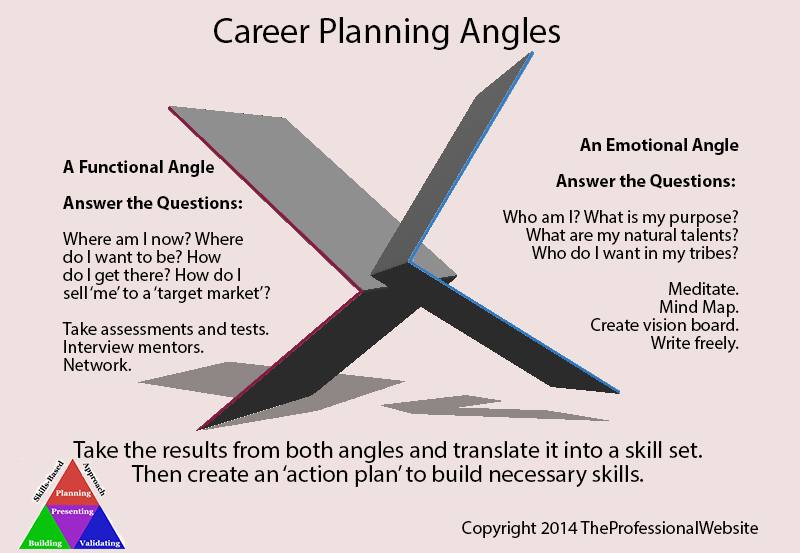 In A Skills-Based Approach to Developing a Career, I take on career planning from a functional angle: the building and validating of a skill set. [i] Of course, I talk about weighing career passions and capital during the planning stage. Recently I read Finding Your Element by Ken Robinson who comes from an emotional angle: “an inward journey to explore what lies within you and an outward journey to explore opportunities in the world around you” (page 5). [ii] Interestingly there is a lot of overlap in our two angles. I talk about taking personality, interests, and strengths tests to become more self-aware, so you avoid threading against your internal self. Similarly, Mr. Robinson says, “finding your Element involves understanding the powers and passions that you were born with as part of your unique biological inheritance (page 22).” He suggests meditating, mind mapping, and creating a vision board to identify your uniqueness and taking some of the same tests I suggest (like Gallup Strength Finder). finding your natural talents and honing them in practice: it is a union of nature and nurture (page 36). There is no denying career planning should be a journey into your soul. For many of us, besides sleeping, we will spend more time doing career related work than any other thing in our life (some estimates put it between 15 to 30 percent). I standby the importance of striving for career happiness and fulfillment. Regardless of the source of your career plan, whether it comes from a functional or emotional angle, take the results and translate them into a skill set. You can then create an action plan to build each skill – a sensible way to prepare for a dynamic workplace. [i] Ryan Frischmann. A Skills-Based Approach to Developing a Career. Trafford (2013). [ii] Ken Robinson. Finding Your Element. Penguin Group (New York, 2013).